Some of the cutest animals I have ever seen in the snow. Oh that polar bear is fricken tute. Snow can be a pain, shoveling it off the driveway, or layering on clothes to simply walk outside. Despite all of the adult struggles associated with snow, it’s a magical occurrence that is quite exciting to witness, especially for the very first time. I still remember the moment I saw snow for the first time. Growing up in Southern California sheltered me from snow, and so when I first witnessed a blanket of soft, white, and oh so cold snow I was SO excited. Animals tend to get even more excited about the little things in life than humans, so you can only imagine how amped your pet feels the first time he or she encounters snow. These 22 adorable animals are just jazzed about the change in weather. Check out the pawty these cuties are throwing to celebrate their first time playing in snow. 1. Puppy plows through the snow with unbridled excitement. 2. Kiora’s first play date in the snow! 4. Sweet little pup enjoying her first taste of a snow day. 5. Jumping Jonesy enjoying the first snow, safely on the patio. Cats are so crazy cute! 6. Tilly’s very first snow day is met with adoration and much curiosity. But…but… where is it all coming from?! 7. 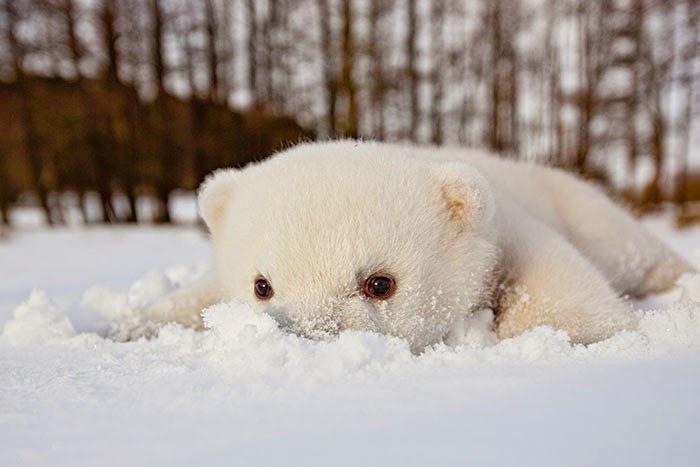 Baby polar bear enjoys playing in the snow for the very first time ever! Polar bears are born and bred to live in very cold climates, meaning this fresh powder brings nothing but sheer excitement to this baby cutie. 8. Baby panda bear getting carried away with the fresh snow. 9. Blue-eyed beautiful baby enjoys his very first snow. 10. Kitty’s first meow through the snow! This Siberian Husky is 8-years old but this is his first time seeing snow. The excitement glitters straight through this dog’s beautiful eyes! Makes me crave introducing my California dogs to the pure pleasure of snow, I can only imagine how crazy they would go. Looks like this dog has some snow ornaments he needs help removing before he catches a cold! 15. Flossie enjoys her first dig in fresh snow.